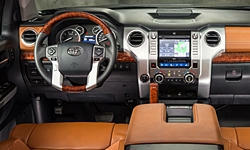 See TSBs and recalls for the 2015 Toyota Tundra. 40000 mi Entune radio intermittently cycling off and back on. Dealer installed software update to fix the problem. 27280 mi Whine during acceleration when outside temps are below -5C. Found noisy water pump, replaced under warranty. 5000 mi Rear seat belt retractor replacement due to issues with locking up when in normal operation. 31000 mi Rotors were warped. Dealer turned them under warranty. US $100 While towing my travel trailer from MI to Yellowstone and back the trailer hitch bent. 31000 mi Infotainment system kept freezing and rebooting and the USB port stopped working. Dealer reflashed the system which fixed the freezing and the USB port. See our lemon odds and nada odds page to see vehicles with no repairs or vehicles with more than three repairs. 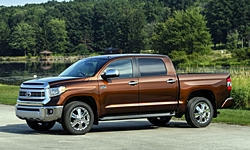 To see how frequently 2015 Toyota Tundra problems occur, check out our car reliability stats.